« Am I Going to Go Blind? In the short history of the Nobler, I’ve managed to post close to 30 unique cocktail recipes. These cocktails are unique in the same way that innovative chefs call upon culinary tradition to introduce new and interesting food. Not that I’m calling myself innovative or a great chef, but you get the point. Even the most revolutionary seeming food and beverage probably calls upon a classic. And that’s a good thing. Because classics are classics for a reason. So when I was thinking about posting a celebratory cocktail for founding Nobler Mark and his soon to be wife Kelly, it wasn’t some wild and crazy mixture that resonated appropriate. But there were two things for sure…it needed to be classic and it needed to have some bubbles! 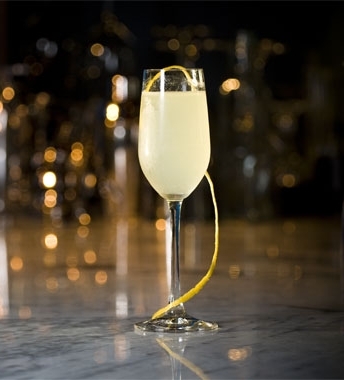 The French 75 was created close to 100 years ago in Paris combining floral gin, tart lemon juice, sweet sugar, and crisp champagne making it a truly balanced cocktail. Strong enough to garner a name referencing a 75mm field gun, but crisp enough for a perfect toast, the only thing I found myself doing was adding some fresh rosemary for garnish. Kelly and Mark have this ridiculous rooftop garden that I am just mildly (extremely) jealous of which is why I love mixing up some cocktails at their place. The fresh rosemary works with the gin perfectly! Congrats to an awesome couple! In a cocktail shaker with ice, mix the first three ingredients vigorously. Pour into a champagne flute, top with champagne and the rosemary sprig and toast accordingly!